Hushpuppy: I see that I am a little piece of a big, big universe, and that makes it right. I went into Beasts of the Southern Wild with no idea as to what I was going to see. I had only heard about it being very well received at Sundance and Cannes, but little in the way of what the film was actually about. Vague descriptions used key words like “fantasy” and “Katrina”, but I still did not have much of an “in”, before sitting in my seat getting to watch the film for myself. To my delight, ‘Beasts’ turned out to be one of the most unique films I have seen this year. With elements of Spielberg and Terry Gilliam, combined with the use of a sort of documentary-style grittiness, the film is creative, affecting, and nontraditional in many ways. ‘Beasts’ deals with what it takes to be a survivor and how to handle grief, but serves as a fable of sorts as well, with a great performance from the young girl at the center of the story. 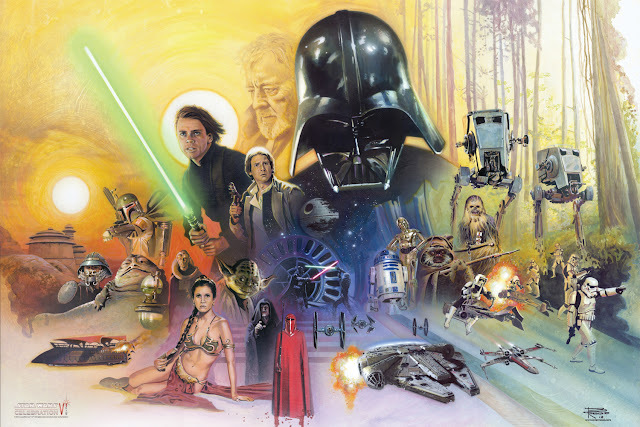 I should go easy on describing the plot, but I can delve into some aspects. 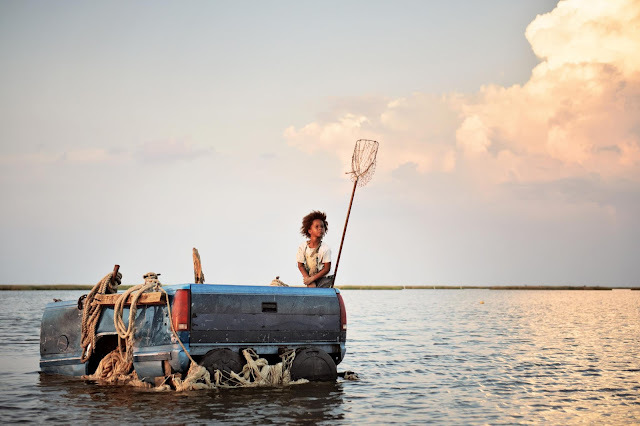 The film revolves around the journey of Hushpuppy (Quvenzhane Wallis), a six-year-old girl who lives with her father, Wink (Dwight Henry), in a community known as “the Bathtub”, located in the southern Delta area of Louisiana. Told from the perspective of Hushpuppy, she has had to learn how to deal with growing up fairly alone, as her father appears to be having issues (which extends beyond his tough love approach to raising Hushpuppy). At the same time, a storm arrives, which pretty much decimates the community of the Bathtub. 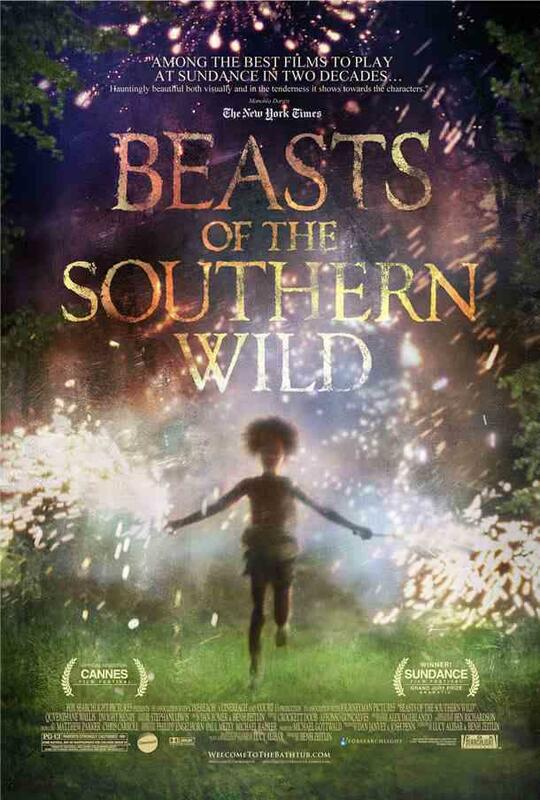 With this new development, Hushpuppy must deal with the struggle of a number of things in her life, including a fantastical aspect that involves her imagination manifesting creatures known as the aurochs. This film is visually arresting. I have stated that the story is told from Hushpuppy’s perspective, but that is made quite clear in the way the camera constantly takes focus from her position. We get to see all that she believes is happening, which makes the way the storm occurs all the more sensationalized, given how Hushpuppy’s logic melds into what she believes is happening. 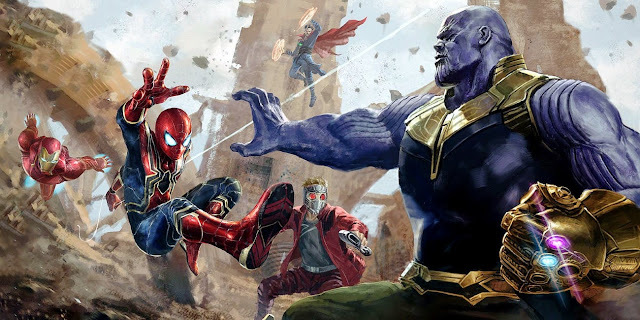 Given that this is most certainly a low budget, independently made feature, it gives a chance for the filmmakers to really be creative when it comes to handling so much of the vision they strove for with this film. Additionally, as we are seeing much of the film through Hushpuppy’s eyes, we get to observe the community of the Bathtub and take in all that comes with it. People are basically poverty-stricken, but they do not see it that way. This is a close group of people that have their own way of functioning in life. 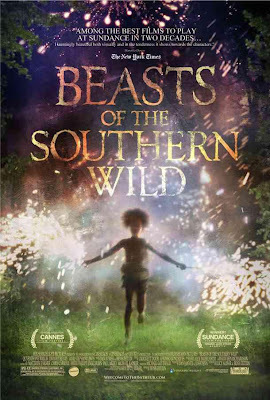 Ramshackle houses and a very specific type of transportation for Wink and Hushpuppy are detailed enough for us to want to reflect on societal differences, but the film is not necessarily judging this. Instead, writer/director Benh Zeitlin and his crew have created a very specific look for the Bathtub and the way we are meant to see it. I can imagine this scenery provoking different reactions from different audiences, but the film has a good handle on what is supposed to be tragic and what can be observed with a hint of a smile. While the cinematography was my favorite aspect of this film, the very strong lead performances definitely helped the film as well. 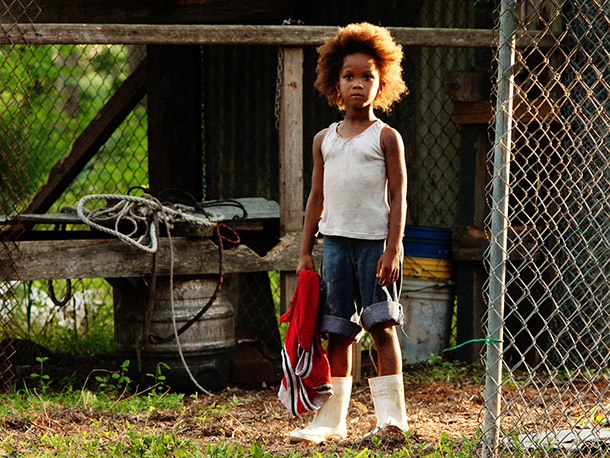 As Hushpuppy, Wallis is given the task of playing quite the difficult role for a character so young. 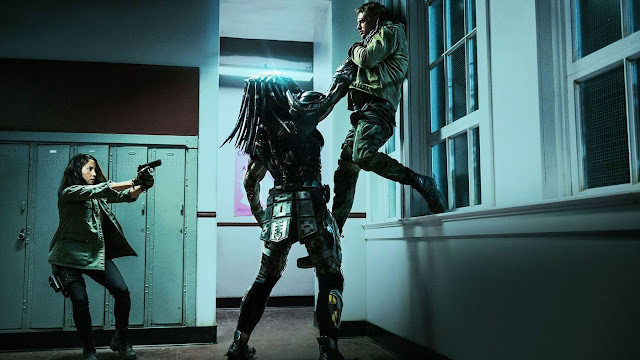 It is rare to observe a strong screen presence from a character like this that does not revolve around their precociousness or inherent cuteness. Instead, we have a young girl who is already dealing with unique living arrangements and is forced to deal with some heavy drama in her life at a young age. Having Dwight Henry as her father (both of these people are non-professional actors, by the way), the film settles into a strong relationship story, with Wink essentially passing on the concept of being resilient in a harsh reality, through the use of seemingly rough behavior. Somewhat akin to how I saw Brad Pitt’s role as the father in last year’s Tree of Life, Wink seems like he could be a difficult man, but he clearly loves his child while also needing to be domineering. The fact that Hushpuppy has an idea of what is going, which involves a certain inevitable situation, makes it work that much better. One can address the background commentary as well, but I do not see it as necessary. Similar to the way various films have used 9/11 as a backdrop to their story (and I’m speaking of the good ones, 25th Hour comes to mind), Beasts of the Southern Wild may have ties to the events that followed Hurricane Katrina, but it is not the film’s focus and did not feel to have a hidden agenda as far as I was concerned. 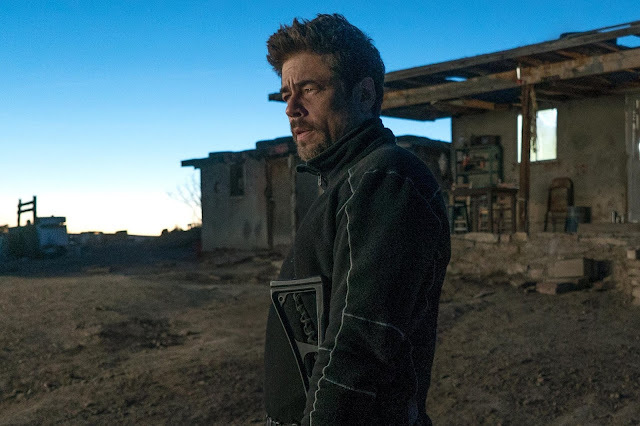 The film is a strong representation of a child’s view of life, relationships, and tragedy, and it uses unconventional filmmaking techniques to have that all come through. 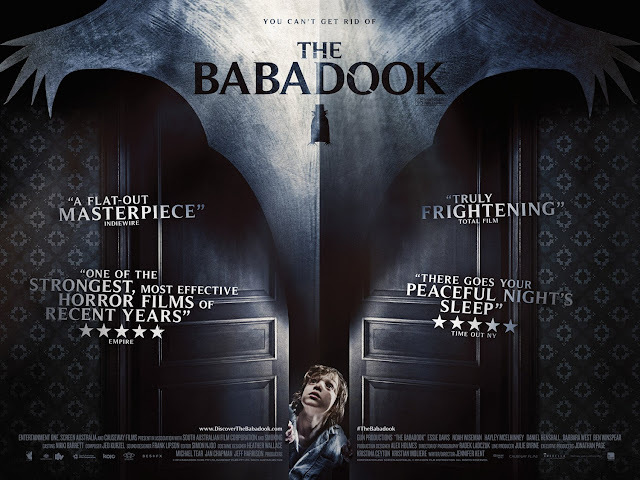 There is a level of weirdness to it that I appreciated, but also a lot of intriguing aspects that kept me involved with the film, whether it is due to the plot, the characters, or the visual construction. It is an indie that very much underlines the concept of interesting filmmaking being an enjoyable experience. Hushpuppy: Everybody loses the thing that made them. The brave men stay and watch it happen. They don't run.